Hear what raised the gooseflesh in 1952. Seen above, This Is Cinerama with a frame of High Noon overlaid. Add to the enormous disparity in image size, the difference in the limited range monophonic optical sound of the conventional film with seven channel full range magnetic stereophonic sound. It's not difficult to understand why Cinerama was impressive in 1952. It has not lost its impact more than fifty years after its debut. Even today, the image and sound in this mid-twentieth century time capsule stun new audiences whenever the film is shown. It was the movie going public's first experience with a giant wide screen and true stereophonic sound. This Is Cinerama premiered September 30, 1952 at the Broadway Theatre in New York, and nine months later moved to the Warner Theatre, where it would complete a two year run. 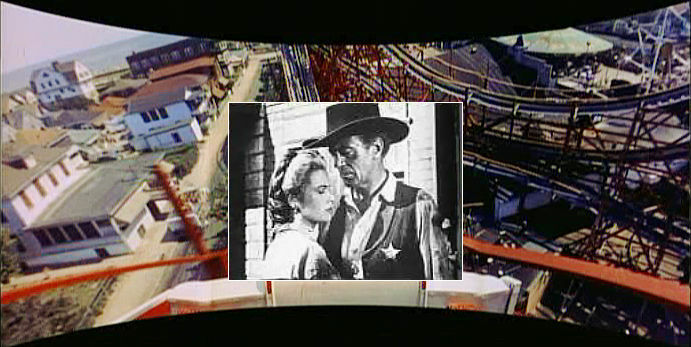 This famous film sequence was directed by Mike Todd Jr., son of Cinerama partner and Broadway entrepreneur and showman Michael Todd, who would leave Cinerama just prior to the premiere to form his own company and would develop the new 70mm process, TODD-AO, a valiant attempt to duplicate Cinerama using less complex technology. 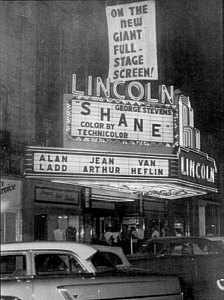 In early 1953, just a few months after Cinerama made its sensational debut, Paramount kicked off the wide screen format competition with its release of Shane. The film was photographed in conventional three-strip Technicolor, using the standard Academy 1.37:1 aspect ratio, but Paramount demanded it be projected with the top and bottom cropped to yield an unremarkable 1.66:1 aspect ratio on the biggest new screens that theatres could install. 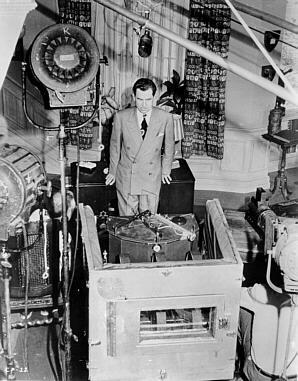 New York Times film reviewer Bosley Crowther stated that the new shape wasn't much different than the old, but the use of bigger screens was long overdue, especially in theatres as big as Shane's premiere venue, Radio City Music Hall. Well, DUH! The Lincoln Theatre of Lincoln, Nebraska was owned and operated by the Cooper Foundation. It should be noted that the banner flying above the marquee makes no width claims, it just advertises that the screen has gotten bigger. The Cooper Theatre chain would again demonstrate their progressive attitude when they built the first "Super" Cinerama theatre in Denver, Colorado.